If the holiday season was launched with the lighting of Ledoux Street in early December, it's culmination was the Christmas Eve extravaganza of farolitos in Velarde. For two miles leading north into the northern New Mexico village more than 2000 paper bags filled with sand and a glowing votive candle line Highway 68. 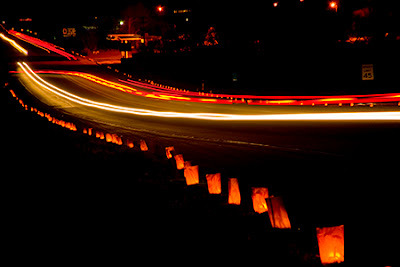 Based on Las Posadas, the hispanic celebration of Mary and Joseph's search for lodging and a place for Jesus' birth, the families of Velarde have been lighting the roadway for almost thirty years.